We met Scottee and Asad in the rehearsal room for their new show Fat Blokes, which had just premiered at Southend and was going on to run in Peterborough, Manchester, London and across the UK in the Autumn. Scottee, an artist and activist, predominantly makes work in collaboration and for this show they had applications from 100 men, 30 of whom came for a workshop audition where the selection process was not about ability and skill but about diversity of bodies and stories, and creating an environment where everyone could be themselves. Scottee talks about the importance of creating a safe and democratic space to make their work together. Each rehearsal opens and closes with ‘The Noticeboard,’ an opportunity for everyone in the room to share where they’re at emotionally and physically with the process. Per diems paid to performers are more than the average, the accommodation is always nice, there is space to be honest and open and make decisions about what your own boundaries are. Everyone is asked for their ‘safety blanket,’ what’s the one thing they need in order to feel safe when they’ve had a hard time – sweets in the fridge, music or food, it is made sure that their needs are catered for. Performers are paid over the equity minimum because they are valued as artists, regardless of whether they’ve ever performed before. It’s striking that although Scottee owns that he has to create a brand of himself in order to play the game which gets him funding, booking and recognition for his work, he puts the openness of his approach down to his lack of training. ‘It’s never been about what I wanted to do. The idea comes first – it’s way more interesting to work with real people.’ Whilst others may have had it instilled in them that they have to lead from the front, Scottee embodies the role of leader as facilitator and the effects are significant. This approach is hugely powerful for both him and the people he works with, and it’s helping to change the way theatre works. Asad said, ‘I think of theatre as pretty passive but in our previews audiences were heavily involved, feeling uncomfortable, laughing, crying, being moved.’ This kind of engagement is crucial when trying to address how people experience theatre. Both men spoke about their frustration with the existing arts and cultural scene and how exclusive it can be, opening doors to the privileged and not including or being represented by enough diverse voices. Asad spoke of not feeling welcome at arts venues, specifically due to race and class, and both spoke about how programming and the staffing and openness of venues can make many people feel excluded or unwelcome. When I asked Scottee how the sector could move towards change he said ‘We need to burn it down and start again.’ The problems are so systemic that in order to effect real change it’s not about tweaking around the edges but fundamentally changing how we see and make culture. The success of Scottee’s work however, is absolutely a step towards this. Whether in Fat Blokes, his work with Peterborough Pride, his ground-up work in places such as St Helen’s or his new work on class, his work has at the centre of it this validation of others, and his infectious openness and belief in himself that encourages others to believe in themselves too. His work is moving because it shows people at their fullest, who they really are, and allows them to reveal the stories behind how they got there. Being part of the process has been transformative for Asad’s confidence, in our conversation he repeats Scottee’s words to him ‘you’re valid and you deserve to be here.’ He’s now auditioning to be a plus size model and has caught the performance bug. 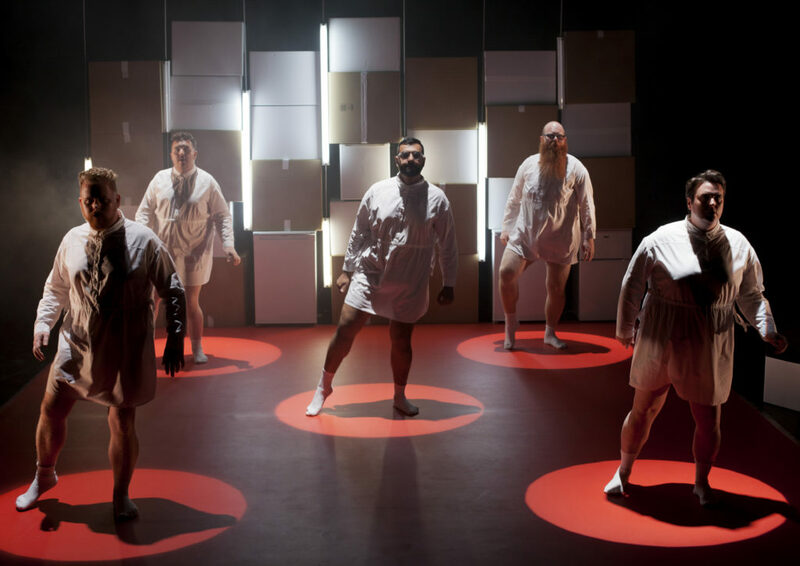 Scottee’s work is a clear and obvious example of there being no necessary divide between a democratic approach and work of the highest quality – instead we see how much quality an approach like this can bring to the stage, and how artistic integrity is not compromised, but instead heightened. His trust in people shines through in their performances, leading to great initial reviews for Fat Blokes. But this trust also helps to embed change through his work in communities by leaving a legacy of people who may previously not felt they had a lot of power, going on to make change in their lives and in the communities around them.